Former Manchester United players Owen Hargreaves and Paul Scholes said that Marcus Rashford stood out for the Red Devils against Valencia. United laboured to a goalless draw at Old Trafford against the La Liga giants on Tuesday night, which saw them drop two valuable points in the Champions League group stages. Jose Mourinho’s men looked toothless in attack once again, as they have done for the majority of the 2018-19 campaign so far, but there was one positive to come out of the game, in the form of Rashford’s contribution. The England striker gave his all throughout the contest and tried his best to spark the team into life, running at defenders and trying to drive forwards at every opportunity, but he was ultimately unable to affect the outcome. 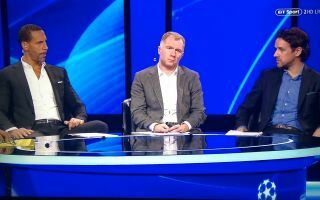 Scholes also singled out Rashford for praise, before commenting on Romelu Lukaku’s worryingly subdued performance upfront, stating: “He was the one player you thought had a bit of anger in him. Could the former United midfielder’s comments provide food for thought for Mourinho ahead of their next Premier League clash against Newcastle on Saturday? Maybe Rashford deserves a chance to lead the line for the Red Devils in Lukaku’s stead, given the Belgian’s lack of bite in the final third and general anonymity on the pitch in recent weeks. Whatever the Portuguese coach decides, it is vital that his team picks up a win this weekend to steady the ship, with the wolves firmly planted at his door in the wake of the club’s latest underwhelming display.